*Note: the glue hasn't quite dried on these pine-cones yet, but I couldn't wait to share this with you. The glue will dry clear. This is an inexpensive and easy craft idea to do with the children that will leave your house smelling 'holiday ready'! Place them on a foil covered baking sheet and put them in a 200 degree oven for about an hour. This will open them up and eradicate any little creatures that might be lingering there. Usually I spray mine with bug spray and let them sit in a closed bag for a few days after collecting them. In a large ziploc bag, combine about 1/8 cup of your favorite spices. I like a 2-1 mixture of cinnamon and cloves. You could also use nutmeg, ginger and/or allspice depending on your personal tastes. 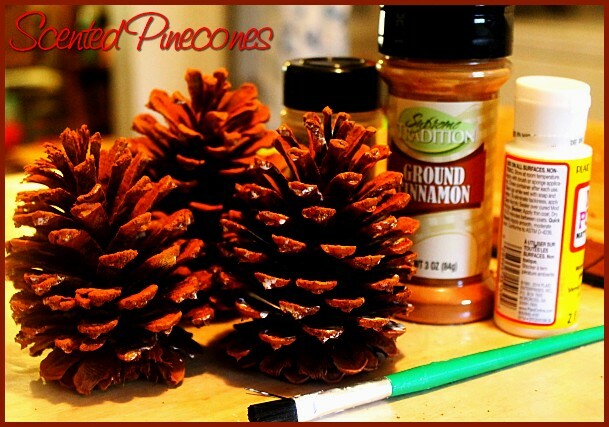 Brush the pine-cones with glue. Place them 2 or 3 at a time in the bag of spices and shake until coated. Remove from bag and place them on wax paper, allowing them to dry. Store them in closed bags until you are ready to use them. They make a nice table display in a wicker basket. You could also attach strings to them and hang them on your Christmas tree.